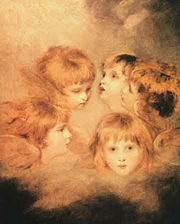 A Cherub Head in Different Views by Joshua Reynolds. A cherub (Hebrew: כרוב, plural כרובים kruvim) is a supernatural entity mentioned several times in the Hebrew Bible, and in the Christian Book of Revelation, as well as often being depicted in western art. The correct plural can be written as cherubim or cherubs; the former has theological connotations, whilst the latter generally refers to the stereotypical depictions of cherubim in western art. As most English speakers are unfamiliar with Hebrew plural formation, the word cherubims is sometimes incorrectly used as a plural. The Cherubim appear numerous times in the Bible. For example, two cherubim guarded the Garden of Eden after the Fall of humankind. They are also described as acting as the chariot of Yahweh in Ezekiel's dream. Their significance is further demonstrated by the fact that two sculpted cherubim were included as part of the mercy seat on top of the Ark of the Covenant (Exodus 25:18-21). The Book of Numbers depicts the voice of God as speaking to Moses from between the two Cherubim on the Ark (Numbers 7:89). 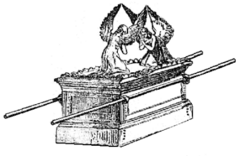 A late nineteenth-century artist's conception of the Ark of the Covenant, employing a Renaissance cassone for the Ark and cherubim as latter-day Christian angels. Orthodox Judaism includes belief in the existence of angels, including Cherubim, within its angelology, as does Conservative Judaism, although some factions in the latter interpret certain liturgical references to Cherubim more figuratively. In accordance with the Talmud, when the Birkat HaMazon (Grace after Meals) is recited by at least ten thousand seated at one meal, the special blessing "Blessed is Ha-Shem our God, the God of Israel, who dwells between the Cherubim" is traditionally added to the regular liturgy. The word is also used to refer to the depictions of Cherubim in Solomon's Temple, including the two cherubim that were part of the Ark of the Covenant. The Book of Numbers depicts the voice of God as speaking to Moses from between the two Cherubim atop the Ark (Numbers 7:89). Reform Judaism and Reconstructionist Judaism generally either drop references to angels or interpret them metaphorically. However, in Kabbalah and in the tenets of Hassidic Judaism, there has long been a strong belief in Cherubim, with the Cherubim, and other angels, regarded as having mystical roles. The Zohar, a highly significant source of Jewish mysticism, states that the Cherubim were led by one of their number, named Kerubiel. To some extent the buraq—a flying animal white and long, larger than a donkey but smaller than a mule—which in Islam is considered to be the mount of the Prophets, may resemble the kirabu described below or other such composite creatures. The buraq is nowhere considered an angel, however. The angels in general are described in Islamic sources as capable of taking on numerous forms most of them more or less human-like and including many of the features known in the Jewish and Christian traditions. In Catholic theology, the cherubim are second highest rank in the angelic hierarchy, below the Seraphim. Pseudo-Dionysus famous work on angelology De Coelesti Hierarchia'' (The Celestial Hierarchy) (dated ca. fifth century) exerted a great influence on scholasticism as it elucidated at great length the hierarchies of angels. Thomas Aquinas (Summa Theologica (I.108) followed the Hierarchia (6.7) in dividing the angels into three hierarchies each of which contains three orders, based on their proximity to God, correspoding to the nine orders of angels recognized by St. Gregory. A Shedu, which some scholars identify as the origin of Cherubim. Linguistic scholar Roland De Vaux wrote that the term cherubim is cognate with the Assyrian term karabu, Akkadian term kuribu, and Babylonian term karabu; the Assyrian term means 'great, mighty', but the Akkadian and Babylonian cognates mean 'propitious, blessed'. 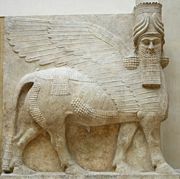 In some regions the Assyro-Babylonian term came to refer in particular to spirits which served the gods, in particular to the shedu (human-headed winged bulls); According to the authors of the Jewish Encyclopedia, Assyrians sometimes referred to these as kirubu, a term grammatically related to karabu. According to Peak's Commentary on the Bible, a number of scholars have proposed that cherubim were originally a version of the shedu] protective deities sometimes found as pairs of colossal statues either side of objects to be protected, such as doorways. However, although the shedu were popular in Mesopotamia, archaeological remains from the Levant suggest that they were quite rare in the immediate vicinity of the Israelites. The related Lammasu (human-headed winged lions—to which the sphinx is similar in appearance), on the other hand, were the most popular winged-creature in Phoenician art, and so most scholars suspect that Cherubim were originally a form of Lammasu. In particular, in a scene reminiscent of Ezekiel's dream, the Megiddo Ivories—ivory carvings found at Megiddo (which became a major Israelite city)—depict an unknown king being carried on his throne by hybrid winged-creatures. According to archaeologist Israel Finkelstein, the Israelites arose as a subculture in Canaanite society, and hence regarded it is as only natural for the Israelites to continue using Canaanite protective deities. A pair of shedu, protecting a doorway (the body of the creatures extending into the distance). According to the editors of the 1906 Jewish Encyclopedia, the Lammasu was originally depicted as having a king's head, a lion's body, and an eagle's wings, but due to the artistic beauty of the wings, these rapidly became the most prominent part in imagery;  wings later came to be bestowed on men, thus forming the stereotypical image of an angel. The griffin—a similar creature but with an eagle's head rather than that of a king—has also been proposed as an origin, arising in Israelite culture as a result of Hittite usage of griffins (rather than being depicted as aggressive beasts, Hittite depictions show them seated calmly, as if guarding), and a few scholars have proposed that griffin may be cognate to cherubim, but Lammasu were significantly more important in Levantine culture, and thus more likely to be the origin. "and he rode upon a cherub and did fly: and he was seen upon the wings of the wind". 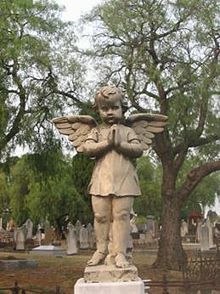 A Christian putto; angel from the Melbourne General Cemetery. There were no cherubim in the Herodian reconstruction of the Temple, but according to some authorities, its walls were painted with figures of cherubim; paintings of cherubim continued in Christian art. In western art, Putto (pl Putti) (innocent souls, looking liked winged children, that sing praises to God daily) are sometimes mistaken for Cherubim, although they look nothing alike. In Christianity, they are often represented in iconography as faces of a lion, ox, eagle, and man peering out from the center of an array of four wings (Ezekial 1v6, 8, 10v12, 21 Revelation 4v8); Seraphim have six wings; the most frequently encountered descriptor applied to Cherubim in Christianity is many-eyed, and in depictions the wings are often shown covered with a multitude of eyes (showing them to be all seeing beings). Since the Renaissance, in Western Christianity cherubim have sometimes become confused with putti—innocent souls, looking liked winged children, that sing praises to God daily—that can be seen in innumerable church frescoes and in the work of painters such as Raphael. ↑ Cherub Retrieved February 25, 2008. ↑ Roland De Vaux, and John McHugh (trans. ), Ancient Israel: Its Life and Institutions (NY, McGraw-Hill, 1961). ↑ G. Ernest Wright, Biblical Archaeology (Philadelphia, Westminster Press, 1957). ↑ Israel Finkelstein and Neil Asher Silberman, The Bible Unearthed: Archaeology's New Vision of Ancient Israel and the Origin of Its Sacred Texts (Free Press, 2002). ↑ Helen Rosenau, Vision of the Temple: The Image of the Temple of Jerusalem in Judaism and Christianity (London: Oresko Books, 1979). De Vaux, Roland, and John McHugh (trans.). Ancient Israel: Its Life and Institutions. New York, McGraw-Hill, 1961. Wright, G. Ernest. Biblical Archaeology. Philadelphia: Westminster Press, 1957. This page was last modified on 9 February 2017, at 19:37.